James Moody at Birdland - 2/14/2003 - by Roberta E. Zlokower. Behind the Scenes at the New York City Ballet - 2/27/2003 - by Rachel Rabkin. - Article sponsored by Danskin. New York City Ballet - Square Dance, Reliquary, Sonatas and Interludes, Vienna Waltzes - 2/20/2003 - by Roberta E. Zlokower. - Article sponsored by Danskin. New York City Ballet - Concerto Barocco, Chiaroscuro - The Play of Light and Shadow, Soirée, Symphony in C - 2/19/2003 - by Roberta E. Zlokower. - Article sponsored by Danskin. La Boca - Argentine Tango at Il Campanello - 2/11/2003 - by Roberta E. Zlokower. Sarah La Rocca's NOCTURNE at Empire Dance - Argentine Tango - 2/15/2003 - by Roberta E. Zlokower. 18th Annual Lunar New Year Festival Of Chinese Dance, Music, and Peking Opera - 2/9/2003 - by Roberta E. Zlokower. Pablo Aslan's Avantango presents New York Tango: Piazzolla & Beyond - 2/14/2003 - by Roberta E. Zlokower. Embattled Garden - Solos - 1/29/2003 - by Natalie Laruccia. Embattled Garden - Duets - 1/29/2003 - by Natalie Laruccia. Embattled Garden - Perspective - 1/29/2003 - by Natalie Laruccia. Embattled Garden - Multiple - 1/29/2003 - by Natalie Laruccia. La Boca Candids - 2/4/2003 - by Roberta E. Zlokower. El Chachafaz Argentine Tango at Pierre Dulaine Studios - 2/6/2003 - by Roberta E. Zlokower. La Belle Epoque - 2/7/2003 - by Roberta E. Zlokower. Sarah La Rocca's All Night Argentine Tango Milonga at Stepping Out Studios - 2/8/2003 - by Roberta E. Zlokower. Cafe Dominguez At Empire Dance - 2/9/2003 - by Roberta E. Zlokower. Toshiko Akiyoshi Jazz Orchestra Featuring Lew Tabackin at Birdland - 2/3/2003 - by Roberta E. Zlokower. New York City Ballet - Mozartiana, The Steadfast Tin Soldier, Tarantella, Symphony in C - 2/16/2003 - by Roberta E. Zlokower. - Article sponsored by Danskin. New York City Ballet - Interplay, Piano Pieces, I'm Old Fashioned - 2/12/2003 - by Roberta E. Zlokower. - Article sponsored by Danskin. Argentine Tango at Bailemos Tango - 2/1/2003 - by Roberta E. Zlokower. Argentine Tango at La Belle Epoque - 1/31/2003 - by Roberta E. Zlokower. Jose "El Canario" Alberto at Club Babalu Latin Thursdays - 1/30/2003 - by Roberta E. Zlokower. An interview with Jose "El Canario" Alberto - Bandleader, Composer, Singer, Musician - 1/30/2003 - by Roberta E. Zlokower. Birthday Dances at Jack Rose - 2/12/2003 - by Robert Abrams. Martha Graham Candids - 2/1/2003 - by Roberta E. Zlokower. Martha Graham Candids - 1/29/2003 - by Roberta E. Zlokower. La Boca Candids - 1/28/2003 - by Roberta E. Zlokower. The Argentine Folklore influence in Tango - 2/13/2003 - by Virginia Kelly. New York City Ballet - Square Dance, Opus 19/The Dreamer, Agon - 2/9/2003 - by Rachel Rabkin & Robert Abrams. - Article sponsored by Danskin. Serena's Belly Dance Odyssey at the Pantheon Theater - 1/26/2003 - by Roberta E. Zlokower. FREE TANGO LESSONS AT ARGENTINE CONSULATE - 2/12/2003 - by Donna Lamb. Regina Carter Quintet - Birdland Debut - 1/23/2003 - by Roberta E. Zlokower. will be performing at the Lang Performing Arts Center at Swarthmore College on Saturday March 15 at 8 pm and Sunday March 16 at 6 pm. Tickets are $20 (with student ID $15, group rates are available). For more information call 610-812-6125, or go to www.opus1dance.com. The performance will feature an excellent corps of 21 dancers directed by Lina and Tim Early, as well as guest artist Sophia Castaldi, formerly of the Miami City Ballet. This performance will also feature a guest appearance by the Brandywine Ballet. Check out this exhibit on Degas and Dance at the Philadelphia Museum of Art. Argentine Tango at La Belle Epoque - 1/24/2003 - by Roberta E. Zlokower. Candids from the opening of Movimientos en Color - a collection of dance photography by Lisa Allen, presented at Empire Dance Milonga de Suenos - 1/29/2003 - by Roberta E. Zlokower. Empire Dance Milonga de Suenos Candids - 1/22/2003 - by Roberta E. Zlokower. La Boca Candids - 1/21/2003 - by Roberta E. Zlokower. …And the Dance Oscar Goes To… - 2/8/2003 - by Rachel Levin. ExploreDance.com is proud to announce this year's nominees for Best Dance Scene in a Motion Picture. Okay, okay, this is an Oscar category that doesn't exist, but that has never stopped us before. Tai-Gu Tales - The Life of Mandala - 2/5/2003 - by Robert Abrams. Argentine Tango - Sarah La Rocca's NOCTURNE at Empire Dance - 1/18/2003 - by Roberta E. Zlokower. Argentine Tango - La Belle Epoque - 1/17/2003 - by Roberta E. Zlokower. La Nacional - 1/16/2003 - by Roberta E. Zlokower. Empire Dance Milonga de Suenos - 1/15/2003 - by Roberta E. Zlokower. Jadite Galleries Opening Reception - Art Opening, Dancers as Art Representatives - 1/21/2003 - by Roberta E. Zlokower. Swango, the fusion… - a review of the expanded show - 2/7/2003 - by Robert Abrams. New York City Ballet - Opus 19/The Dreamer, Sonatas and Interludes, Burleske, Agon - 2/5/2003 - by Roberta E. Zlokower. - Article sponsored by Danskin. New York City Ballet - Concerto Barocco, Valse-Fantaisie, Variations Pour Une Porte et Un Soupir, Symphony in C - 2/4/2003 - by Roberta E. Zlokower. - Article sponsored by Danskin. New York City Ballet - A review of the music from Concerto Barocco, Valse-Fantaisie, Variations Pour Une Porte et Un Soupir, Symphony in C - 2/4/2003 - by Dr. Henri Delbeau. - Article sponsored by Danskin. New York City Ballet - Kammermusik No. 2, Ballade, Piano Pieces, Jeu de Cartes - 2/2/2003 - by Roberta E. Zlokower. - Article sponsored by Danskin. New York City Ballet - Mercurial Manoeuvres, Burleske, Sonatas and Interludes, Chaconne - 1/31/2003 - by Roberta E. Zlokower. - Article sponsored by Danskin. A Tanguera's Valentine - 2/6/2003 - by J. Salmon. New York, NY - The New York Chinese Cultural Center (NYCCC) presents its 18th Annual Lunar New Year Celebration at the Tribeca Performing Arts Center (199 Chambers Street in New York City). The festival features premiere works by the Chinese Folk Dance Company and their special musical guest, Ba Ban Bamboo and Silk Ensemble. There will be three performances: Saturday, February 8, at 2 pm and 7:30 pm and Sunday, February 9 at 2 pm. General admission tickets are $20 or $15 for students and seniors. The event will also include lobby exhibits by Museum of Chinese in the Americas (MOCA) and local artists and vendors. 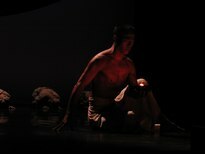 For more information call NYCCC at (212) 334-3764 or visit our website at www.chinesedance.org. Ask Trish - February 2003 - This month…embarrassing questions sent anonymously - 2/1/2003 - by Patricia Dates O'brien. Susan Rethorst at the Danspace Project at St. Mark's Church - 1/31/2003 - by Anne Zuerner. Martha Graham Dance Company - Reflections of a Post-Modern Dancer - 2/3/2003 - by Anne Zuerner. PSYCHOANALYSIS BY DAY, ARGENTINE TANGO BY NIGHT - 2/2/2003 - by Dr. Susan Kavaler-Adler.